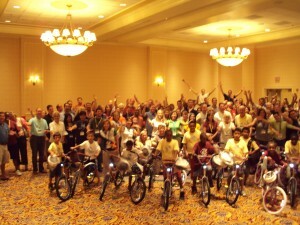 Merck and Company hosted a Build-A-Bike ® Team Building Event at the Renaissance Hotel in Washington, DC, yesterday, August 10th. Over 200 Salespeople and representatives from their Keystone and Virginia regions were there to enjoy the activities and even learn a little something. The event begins with some light instruction and is followed by an activity in which each group selects a captain, names the team, designs a team flag and creates a team cheer. The flags are displayed the the cheers performed before a panel of judges made up by their peers. This is a wonderfully fun and creative time for everyone. The highlight of the Build-A-Bike ® Team Building Event is the last exercise in which the participants have to solve riddles, answer questions and work together to get parts to build bikes for a local charity. In this case 32 bikes were made that went to children from the local boys and girls clubs. It is a great experience when the children receiving the bikes are brought in to pick out their very own bikes. It is a moving experience that gives added meaning and value to the fun throughout the program. Adding fun to learning is an important principle to incorporate. When learning is forced, or not connected to other activities the retention is short. That why repetitious studying before a test only last a short time. “A” student will say it last until after the test; “B” student will say it last until the test; “C” student have the ability (or handicap) of being able to think about something else while they appear to be studying. To combine some fun with the learning experience helps the retention schedule. This is accomplished in this program by giving a series of pictures for the participants to focus on that are related to people principles. For this gathering in Washington, DC, there were several “keywords” their meetings will be focusing on so we worked them into a series of pictures. By visualizing the pictures we created an image that was very memorable, then we linked the visualization to people principles that highlighted the keywords Merck had requested. As a result, in a matter of minutes people learned the principles in a fun, thought provoking way that they will easily retain. The Build-A-Bike ® Team Building Event is a great way to integrate fun and learning, with the added bonus of giving to the local community. Thanks Merck, DC is better for having you visit.